She shared her experience in organizing the Committee’s activity when due to hard economic situation Georgia was unable to finance the development of sports in the country. It is due to sponsors, namely to Badri Patarkacishvili that Georgia managed to participate in various sports events, she said. As a result Georgian sportsmen won two gold medals at the last Olympic Games, whereas National Women Chess Team of Georgia became the winner of the World Chess Olympiad. 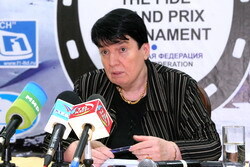 Nona Gaprindashvili regretted her not being able to participate in the 2008 Women’s Chess Championship in Nalchik last year, because of the events in South Ossetia. But this year when the opportunity to visit Nalchik presented itself, without a moment’s hesitation, she took the decision to come to Nalchik. Nona mentioned that she is not currently much involved in public activity and being “a free citizen of Georgia” as she now calls herself. In future she hopes to see her country independent and strong. The outstanding chess player believes that policy makers will come to reason in the long run. “The peoples of Russia and Georgia are enjoying time-honored friendly ties as before and policy makers are unable to shatter them,” – Gaprindashvili emphasized. 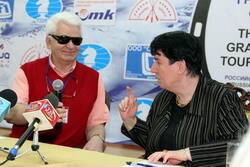 The press conference was participated by a world renowned Grandmaster, the tenth World Chess Champion Boris Spassky. By asking questions he brightened up the meeting with the chess legend. It is to be mentioned that Boris Spassky will be commenting the games of the tournament. Then the attention of all those present shifted to an intriguing talk between the two Grandmasters - Gaprindashvili and Spassky. Boris Spassky recollected the game they played against each other in Goteborg. It was a tense and exciting chess fight, which ended in a draw, he mentioned. Gaprindashvili confessed that it was hard for her to play against men. Being persistent, they did their best to win and, consequently, were very reluctant to agree to a draw. It was Nona Gaprindashvili’s first visit to Nalchik and she spoke with admiration about the town and the people. She said she was impressed by the warm and friendly meetings she had had with the local Georgian diaspora and famous people of the republic before the press conference.